The Young Marines Association claims to be a program that teaches children good values and keeps them off drugs. It is made very clear in all of their literature that they are in no way involved with recruitment practices. As a program of the Department of Defense (DOD), through the Marine Corps, is this even possible? What exactly are the eight to seventeen year olds learning in this program and what effect will it have on our society? The Young Marines is not a new organization. It began in 1958. Until the Bush regime, growth had been very slow. Six years ago there were only 32 units throughout the country (About the Young). Now there are over 300 units (Nitkin), an increase of 781%. By 2007, the organization plans on being in every state with at least 380 units (Mission and Vision). That type of growth is phenomenal in any kind of venture. With the Young Marines, not only is it fantastic, it is frightening. The purpose of the Young Marines is to teach children discipline and to teach them to avoid drugs. These sound like great goals, but it is important to remember that these goals have been set by a military organization that enforces obedience rather than discipline and is generating revenue and supporting illegal actions through the War on Drugs. Let's examine these areas of operation within the Young Marines more closely so that we might better understand the issue of the militarization of children and why it is anathema to a free society. Self-discipline is a very important characteristic for survival in our society. Most youth organizations have a focus on teaching children to be responsible for themselves. One of the big differences with the Young Marines is that self-discipline is not about learning to be self-reliant, but as June Reid, Executive Officer of the Rocky Mountain Young Marines in Golden, Colorado states, "They learn to follow orders and get it right the first time." If one of the children does not follow orders, then the entire group is punished by doing physical exercises. She goes on to say that "Peer pressure makes them monitor themselves." Reid explains that the reason for this is that the Young Marines training program ("affectionately called 'Boot Camp'" according to their websites) is identical to the training given in the Marine Corps, with the exception that officers take into account the physical limitations of children. Marine Corps training has never been about independence, but rather, enforcing a lack of persona so that soldiers follow orders without thinking no matter how morally reprehensible they might view the orders. 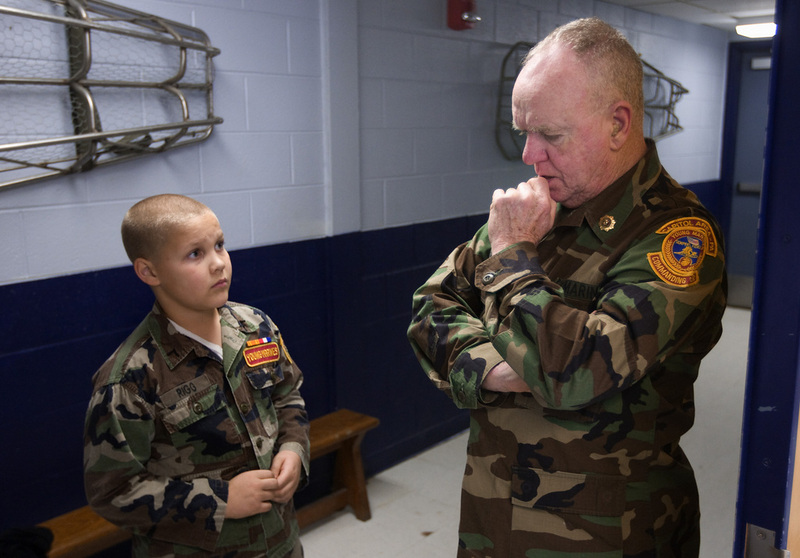 The Young Marines fix children so that they no longer think or act independently. This control that the organization has over children extends well beyond the domain of behavior during "Boot Camp" or other functions of the organization. According to Reid, the children have a weekly review questionnaire that is completed by teachers, parents, and the children themselves to let the officers know what wrong the children have done. If a child did not do their homework one night, the entire group is punished with push-ups. This effectively removes disciplinary functions from authority figures such as parents and places them in the hands of a government agency, the Department of Defense. Another organization that restructured authority functions between the family and state in this way had famously disastrous results. The man whom this organization was named for had an identical philosophy on structuring children that the Young Marines has. To this end he stated that, "My program for educating youth is hard. Weakness must be hammered away." This enigmatic statement was made by Adolf Hitler in 1933 about the Hitler Youth. The quote continues, "In my castles of the Teutonic Order a youth will grow up before which the world will tremble. I want a brutal, domineering, fearless, cruel youth. Youth must be all that. It must bear pain. There must be nothing weak and gentle about it. The free, splendid beast of prey must once again flash from its eyes...That is how I will eradicate thousands of years of human domestication...That is how I will create the New Order" (Hitler Youth). The Young marines put so much stress on the fact that they are teaching children to lead a drug free lifestyle that you would expect it to be the core of their program. It is not. In order to meet this goal, The Young Marines utilize the DARE program. The DARE program has been discontinued in most public schools throughout the country, as research has shown that it has failed in improving a childs chances of avoiding drugs. One report finds that DARE is no "more effective than no program at all" (Does DARE Work). Why do the Young Marines use this program if it is a failure? Is it an afterthought to show that they are teaching a drug free lifestyle? Not exactly. The DARE program was also criticised throughout the 1990s and dropped from educational programs for another reason. The DARE classes are taught by uniformed police officers who work to earn the trust of the children (usually age 10-11) that they work with. You might not think that it so bad for children to trust the police, but think again. DARE was started in 1983 by the Los Angeles Police Department as an informant program. When the officer is able to gain the trust of a child, they can gain information from the child about the drug use of adults in the childs life. There are many documented cases of the DARE program actually breaking families up over infractions such as the posession of marijuana (Bovard). The fact that the Young Marines, an organization proven to be a tool of the state to assume authority of a child over the parent, is using a police informant program to educate children about drug use is quite alarming. The Young Marines take things a step farther. The children are not only educated in this way, they are active participants in the War on Drugs. Every October, Young Marines and participants in other military youth organizations, are invited to attend Red Ribbon Week at the Pentagon. Here they mingle with DOD personnel and hear lectures about the War on Drugs (Department of Defense). In 2003, the children were able to listen to Andre Hollis, former Deputy Assistant Secretary of Defense for Counternarcotics, discuss his position in the drug war. It was Hollis, who in 2003 started the propaganda campaign that drugs were directly related to terrorism (Statement by Andre). As active participants in the War on Drugs, these children are now involved in the War on Terror. The core of the Young Marines drug program is then, not to teach children a drug free lifestyle, but to involve them in counter terrorism efforts through the DOD Counternarcotics division and local police agencies through the DARE program. Putting children in this position is quite dangerous, not just for the child or the family of the child, but for society as a whole. History provides us another example of the danger of placing children in this role. In 1966, Chinese leader, Mao Zedong began efforts to invigorated a youth organization called the Red Guard. The primary motivating factor of the Red Guard was to use peer pressure to modify the behavior of children in their mid-teens just as the Young Marines do. Their focus was to weed out capitalists and counter-revolutionaries (insert "terrorists" here) through a purge in which they often had their own parents arrested and executed. This Cultural Revolution is considered the bloodiest decade in Chinese history. Every contact you might have with the Young Marines overly stresses the fact that they are not a military recruiting organization. June Reid adds a qualifier to this. She says that if a child decides they want to join the military, the Young Marines officers will assist them. Furthermore, Reid states that recruiters often send children who are too young to join the military to the Young Marines. The logic is that because the Young Marines training is identical to Marine Corps training, it will prepare them for the real thing. With this knowledge, it would seem logical that the Young Marines training is a form of recruitment. Additionally, high school students report that military recruiters have been encouraging poolies, or potential recruits, to recruit their fellow classmates. This would be another reason why it benefits the military to send them to the Young Marines. The effort must be working, as Reid confirms that transition from the Young Marines to the Marine Corps has increased dramatically. The importance and prominance of the Young Marines is continuing to increase. Reid notes that the court system is increasingly likely to send kids with problems to the Young Marines. Mr. Bush has given the organization an even larger boost by promising $150 million dollars to help at-risk youth. Naturally, this assistance is earmarked to go to faith based and community organizations (State of the). You can be certain that the Young Marines will likely be one of the largest recipients. The Young Marines is an extremely dangerous organization that has moved into our communities with the intent of turning our children into small soldiers, to create an endless supply of cannon fodder for an ever expansive war. It will no longer be necessary to convince young people to join the military because they will already be a part of it. If compulsory service or another type of draft is initiated, young people will have been conditioned not to resist it. Surveillence culture in this country has been a failure for the most part. American's simply are not socialized to spy on each other. The Young Marines is going to change that. Children are taught from a young age the importance of identifying and reporting what Mr. Bush calls "evil doers." In essence the Young Marines is not only a threat to the health and well being of our children and family relationships, it is a threat to the very stability of culture and community within the United States. With this knowledge it is of the utmost importance that every parent avoid having this military organization infiltrate your family and prevent them from setting up operations within your community. Here are some recommended links available to better inform you about Young Marines. This is a work in progress and NNOMY will be adding new documents as they are prepared and as policies change that effect prograsms that militarize youth . Check back periodically.